What is a NeoGraft/FUE hair transplant? FUE or Follicular Unit Extraction is a technique which allows hair follicle harvesting without the use of a scalpel or stitches and leaves absolutely NO LINEAR SCAR, NO STRIP SCAR. NeoGraft is a sophisticated breakthrough surgical instrument that makes FUE harvesting far more efficient and accurate than previous devices. 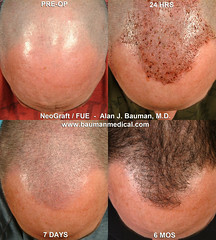 FUE using NeoGraft has been considered a “game-changer” for the field of hair transplant surgery. FUE can be performed with a variety of different tools and instruments and even robotic devices like ARTAS Robotic-Assisted FUE (we do that too, by the way!). Why is FUE considered a “game-changer” for the field of hair transplant surgery? FUE significantly reduces the significant risks, discomfort and downtime of a traditional linear or strip-harvest hair transplant procedure. FUE leaves absolutely NO linear scar, no strip-scar. With FUE, individual follicular unit grafts can be harvested one-at-a-time. Thousands of follicular unit grafts can be harvested without the “zipper” appearance of a linear scar. After just seven days following NeoGraft FUE by Dr. Alan Bauman (above), the donor area shows virtually no sign of the harvesting of nearly 2,000 follicular unit grafts and absolutely no linear scar. Also available, NO-SHAVE FUE which requires NO shaving of the Donor Area. Ask about Dr. Bauman’s NO-SHAVE, Hidden-Shave and Stealth-Shave harvest options which preserve your hairstyle. 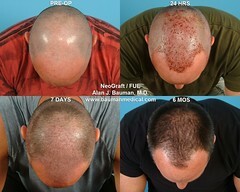 Many believe that NeoGraft is simply a better way to perform a hair transplant. Less invasive than traditional linear “strip” harvesting, Follicular Unit Extraction (FUE) uses no scalpel, no stitches, no staples in the donor area–allowing for faster healing and less discomfort after transplantation. Many of our patients say “this is the breakthrough I’ve been waiting for!” Dr. Alan Bauman has performed FUE procedures since 2001 and he was the first ABHRS board-certified hair transplant surgeon to routinely use NeoGraft for FUE starting in 2008. Today, FUE comprises more than 98% of all cases at Bauman Medical Group. Dr Bauman and his team are among the most experienced FUE hair transplant surgical teams worldwide having performed thousands FUE cases and transplanted well over two million FUE grafts. Most importantly, however, Dr. Bauman and his team take great pride in the artistic quality and naturalness of the final result for every single patient. More than half of all Bauman Medical patients travel in from out-of-town to Dr. Bauman for his renowned artistry, experience and expertise in FUE hair transplantation. To find out if you are a good candidate for NeoGraft/FUE, request a long-distance or in-person consultation with Dr. Bauman today. Full-time ABHRS-certified Hair Transplant Surgeon and NeoGraft FUE hair transplant pioneer, Dr. Alan Bauman, was featured on CBS Early Show. New minimally-invasive FUE hair transplant techniques are gaining popularity because they avoid the unsightly telltale scar of traditional linear/strip harvest hair surgery. 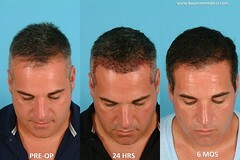 FUE offers less pain, less downtime, faster recovery, more flexible hair styling. Watch the CBS Early Show in New York featuring Dr. Alan Bauman. 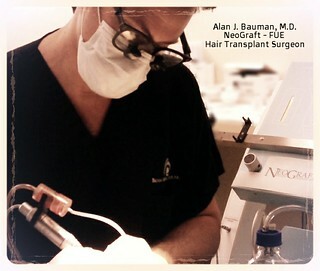 Dr. Alan Bauman has been featured on NBC, FOX and CBS using the NeoGraft device for FUE hair transplantation. Dr. Alan J. Bauman has performed no-linear-scar FUE procedures since 2001 using a variety of tools, including his own “Bauman MINDEX” extractor, the first manual instrument commercially available for FUE surgeons. In 2008, Dr. Bauman became the first ABHRS-certified hair transplant surgeon to routinely utilize the NeoGraft device for hair transplant harvesting. This device has allowed he and his surgical team to harvest and implant hair follicles accurately and efficiently with excellent hair growth rates and artistically-natural hair transplant results. Note: Every NeoGraft FUE hair transplant is performed at Bauman Medical using PRP Platelet Rich Plasma for accelerated healing. What is “NO-SHAVE” FUE? Do I need to shave my head for NeoGraft FUE? No. Smaller harvests (usually less than 2000 grafts) are possible WITHOUT shaving your entire Donor Area. Please note, if you need more than 2,000 grafts, multiple procedures will be needed. No-Shave FUE preserves your hairstyle so you can be back in your routine as quickly as possible. Other options like “Stealth-Shave” and “Hidden Shave” for the donor area are available. Keep in mind that unlike other clinics, we typically DO NOT have to shave the Recipient or grafted Area. 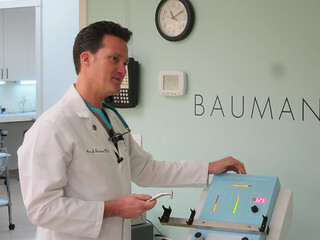 Dr. Bauman works between the existing hairs in both male and female patients. What is FOLLICULAR UNIT EXTRACTION or “FUE” Hair Transplant? Minimally-Invasive Hair Transplantation – “FUE” Procedure Follicular Unit Extraction with NeoGraft leaves no strip scar, no linear scar. The most exciting thing about Follicular Unit Extraction (FUE) is what it enables us to do in the donor area with people who wear very short hair. For many people, having a linear scar is not desirable. So this surgical technique gives us another option for “extracting” or harvesting the permanent donor follicles from the scalp. With FUE, we are able to extract single Follicular Units (that means groupings of 1, 2, 3, and sometimes, 4 hair follicles) individually from the donor area without a scalpel. This also means the patient will not require any stitches and there is absolutely NO linear scar or “no zipper” as it is commonly called. FUE is a much less invasive procedure that heals more quickly and has less activity restrictions postoperatively. For example, patients may swim, play golf, tennis, etc. after just three days. That said, it is a tedious process for the surgeon and the surgical team because it requires significantly more time to get the same numbers of grafts as a traditional (linear or strip) harvest. For many years, we were only able to harvest between 500-700 grafts per day with FUE. Today, the NeoGraft device has enabled us to consistently harvest 1500-1800 grafts or more during a normal procedure day and 3,000-4,000 grafts or more with a two-day “MEGA-FUE” visit. What are the benefits of FUE with NeoGraft? There are many benefits of Follicular Unit Extraction or FUE. Patients walk out of the procedure with the grafts implanted in the Recipient Area just like they do with a traditional hair transplant, but there are no stitches or staples in the Donor Area and therefore less discomfort. The tiny (< 1.0mm) circular incisions will heal and become nearly invisible within a matter of days. From a social distance, the donor area is generally ‘back to normal’ in about a week. Even with available financing and extended payment plans, an FUE procedure may be cost prohibitive for some patients. It’s true, linear harvesting still remains the least costly method of harvesting hair for transplantation. However, a new breakthrough mechanical device, called NeoGraft, is making FUE procedures more efficient year-by-year. 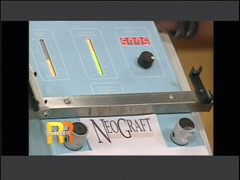 NeoGraft works an extension of the human hand to help harvest hair follicles efficiently from the scalp at a rate of speed that is significantly faster than manual FUE extraction and, with proper technique, significantly more accurate. With every month, it seems more an more surgeons and other doctors are acquiring NeoGraft devices or hiring outside teams to perform procedures in their practices… this can be dangerous for patients. Now more than ever, patients really need to understand how important choosing the right surgeon and surgical team remains. Final hairline design results still are dependent upon the skill and artistic abilities of the surgeon performing the procedure. Often, people make the mistake of concentrating too much on what tool is used or how we extract the grafts and forget the basic rules that apply to artistic hairline design. Novice surgeons are prone to major errors in hairline design, angles and orientation of grafts–creating problems that are not so easy to fix, re-do or hide. So, it is critical that prospective patients evaluate a surgeon’s proven expertise using the FUE Follicular Unit Extraction technique AND artistry… extensive hair transplant experience and artistry is required when designing hairlines so they look natural. Artistry, Experience & Expertise, American Board of Hair Restoration Surgery ABHRS-certified, Fellow of International Society of Hair Restoration Surgeons (FISHRS), full-time hair restoration surgeon, NOT a ‘menu-item’ (i.e., where “hair transplant” or “NeoGraft” is listed as an offering under a menu of non-hair aesthetic services like fillers, botox, laser hair removal, breast augmentation, etc… watch out! ), full-time hair transplant surgical technical staff (not per-diem or for-hire) and of course passion and compassion! 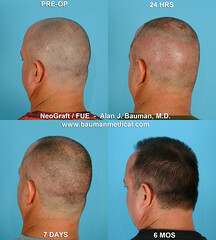 Board Certified Hair Transplant Surgeon, Dr. Alan Bauman, performing NeoGraft FUE. FUE is also a useful procedure for patients who have wide or very visible linear scars. FUE can be used to ‘fill in’ or camouflage those old scars by transplanting new follicles into the area. Dr. Bauman has presented at ISHRS conferences on using FUE for coverage of linear scars as a viable method of treatment of this concerning issue. Dr. Bauman was the first ISHRS surgeon to demonstrate the FUE procedure in a Live Surgery Workshop setting in Orlando Florida in 2003. Dr. Bauman also designed the first manual instrument that was made commercially-available to surgeons specifically to help perform FUE procedures (called “Bauman-MINDEX, available from A to Z Surgical/George Tiemann). Dr. Bauman was the first ABHRS board-certified hair restoration physician to routinely use NeoGraft for FUE procedures.The NeoGraft is the latest advancement in FUE procedures, allowing higher numbers of grafts to be harvested in less time. Did you know there are over five million follicles on the human body? The FUE technique can also be used to harvest follicles from areas outside of the scalp area. Non-scalp harvesting or Body Hair Transplants (BHT) is useful for patients who have depleted Donor Areas from previous transplants. Hair follicles harvested from “alternate sources of donor” such as the beard, the chest, the abdomen or belly, back, arms and legs often have different qualities to them compared to scalp hair so discuss these issues with your Body Hair Transplant surgeon, Dr. Alan Bauman. Dr. Bauman has successfully performed FUE/BHT using beard follicles and other donor zones to camouflage previous hair transplant scars, and to fill in areas of the scalp or scars in patients who have a lack of donor hair available. Are you a candidate for FUE Follicular Unit Extraction? What should be considered? How many grafts will be needed to accomplish your hair restoration goals? How long is the hair on the back of your scalp? What kind of hairstyle to you want to wear (i.e., short hair, buzzcut, etc.)? Do you want to have a tell-tale linear scar to hide or prefer a less-invasive harvesting method? Do you want to have less activity restrictions and less discomfort after your procedure? Are you on treatments (medications or other modalities) to stop the progression of your hair loss? What is NeoGraft™? NeoGraft is a new device which facilitates the harvesting of follicles during an “FUE”-type hair transplant, dramatically improving the accuracy and speed over previously-used FUE manual extraction instruments. Dr. Bauman was one of the first physicians in the United States to use the NeoGraft device routinely for FUE hair transplant procedures and has transplanted well over 2 million FUE grafts. What is an “FUE” hair transplant? “F.U.E.” or “Follicular-Unit Extraction” is an advanced, minimally-invasive hair transplant method which allows for the harvesting of individual follicles from the donor area without a scalpel or stitches, and therefore leaves no linear scar. What are the main benefits of FUE over linear harvesting? It is well-accepted that FUE transplants can heal faster and more comfortably than linear-harvest techniques using a scalpel and requiring stitches. With FUE, once healing is complete, the patient has the option of wearing a very short haircut without the worry of a tell-tale linear scar. Without the need for stitches, downtime is shorter with fewer activity restrictions post-operatively. What are some benefits of NeoGraft over manual FUE techniques? The highly ergonomic mechanical NeoGraft device works as a natural extension of the surgeons’ hand, allowing for faster and more accurate harvesting of hair follicles. NeoGraft patients now reach their goal with less time in the procedure room or fewer FUE procedures altogether. Who is a good candidate for FUE using NeoGraft? Patients who would like the option of wearing a very short haircut in the back or sides of their scalp, or those who want the least amount of activity restriction (e.g. 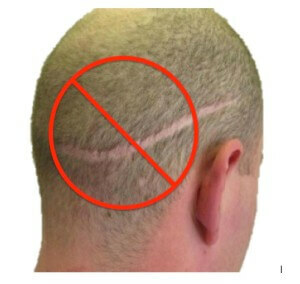 athletes) after their hair transplant procedure, may be good candidates for FUE with NeoGraft. FUE can also be used for ‘scar camouflage’ procedures for patients who have had prior linear harvests, as well as for body hair transplants. What are the major cost differences between FUE and linear-harvest hair transplant procedures? The fee structure for FUE hair transplant procedures reflect the more detailed and intricate nature of those procedures compared to those performed with a linear harvest. Are the final transplanted ‘results’ any different with FUE/NeoGraft than those achieved with linear harvesting? No. FUE procedures, by default, yield grafts that contain mainly one, two or three follicles called “follicular units.” Linear harvests, which are then microscopically dissected by a team into grafts of one, two or three follicles, would also yield similar ‘follicular-unit’ grafts. Provided that in each case the grafts are implanted with care, artistry and precision into the recipient area, the final transplanted results with FUE would be identical to those accomplished with a linear harvest–if follicular unit grafts are used. If the donor area is harvested with careful technique, healthy hair follicles will be accurately obtained. The main difference versus a linear or strip surgery is not in the area of hair growth, but how the donor area is harvested. It is a myth that FUE grafts have lower yield, unless they have been ‘mishandled’ by an inexperienced team. Is FUE/NeoGraft suitable for both men and women? Yes. Because FUE/NeoGraft is a minimally-invasive procedure, it is a viable option for both men and women looking to restore their own living and growing hair with transplantation. For women, harvesting is performed with a hidden or “stealth” shave in the donor area which is covered by the surrounding existing hair. Do I have to get a total ‘buzz-cut’ to have an FUE/NeoGraft procedure? No, but it helps. If your donor hair is long enough, harvesting using the FUE/NeoGraft can be done by shaving small areas which can be covered by your other, existing donor hair. This is called a NO-SHAVE FUE procedure. For small grafting procedures NO-SHAVE FUE keeps your same hairstyle. For maximum yield however, a buzz-cut is recommended in the donor area. Am I a good candidate for a hair transplant procedure using FUE/NeoGraft? The best way to determine whether you are a candidate for hair transplant using FUE/NeoGraft is a one-on-one consultation with Dr. Bauman. Start your consultation today! Does FUE-style transplantation affect hair growth rates? In our experience with “manual FUE” at Bauman Medical Group since 2001, we have seen excellent growth rates in our patients that are NOT significantly different from our other, microscopically-dissected follicular-unit hair transplant grafts from a strip or linear harvest. With each advance in hair transplant history: sessions more than 1000 grafts called “MegaSessions,” microscopically-dissected follicular unit grafts, eyelash transplant procedures, temporal point restorations, etc. there has always been hair growth rate concerns and fears–which time and time again have been proven to be false in our hands. Truth be told, though fragile, hair transplant grafts have excellent survival rates during transplantation as long as they are not mishandled by an inexperienced team. As an example, the commonly held belief that “skinny” grafts (grafts without excess tissue) survive poorly is disproven again and again in our hands during our routine eyelash transplant procedures. Above is an example of a “Manual FUE” procedure performed in 2002 showing excellent growth. Today our procedures using NeoGraft transplant 1500-4000+ grafts with each procedure! 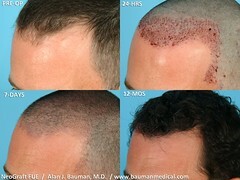 The slideshow above show the results of a NeoGraft hair transplant performed by Dr. Alan J. Bauman in 2009 at various intervals (Before, Day1, Week1, and 12mos). 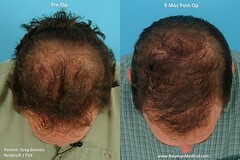 Some of Dr. Bauman’s NeoGraft FUE Before & After Photos showing healing and hair growth results. NeoGraft FUE is also available for women with the No-Shave FUE technique. Ask our office to show you photos of patients who are JUST like YOU! Photos of this patient’s donor area show the advantages of the Follicular Unit Extraction (FUE) hair transplant technique using the 0.8mm NeoGraft device: 1603 follicular-unit grafts were harvested and transplanted during this one-day procedure. No donor strip is taken and there is no residual linear scar to hide after the procedure. NOTE: Postoperatively there is NEVER a linear scar from FUE/NeoGraft. Also, depending on the size of the procedure, Dr. Bauman can perform an FUE procedure without having to shave the entire donor area in some cases so a ‘total shave’ is NOT necessary. Ask about a “hidden,” “stealth” or “no shave” FUE procedure. NeoGraft FUE hair transplantation can be used to fill in, repair and/or camouflage and old linear scar. Kevin ‘Nalts’ Nalty is a YouTube celeb with over 90 million video-views. 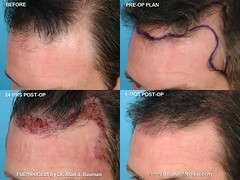 When he decided to get a hair transplant, he went to Dr. Bauman for an FUE/NeoGraft procedure. Here is one of the videos of his procedure (above). To follow his hair loss and hair restoration journey, visit hairofnalts.com video playlist.